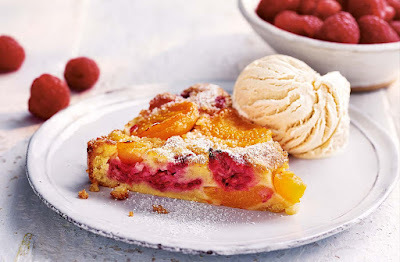 This gorgeous French dessert recipe, traditionally made with cherries, gets a seasonal twist with sweet apricots and raspberries. 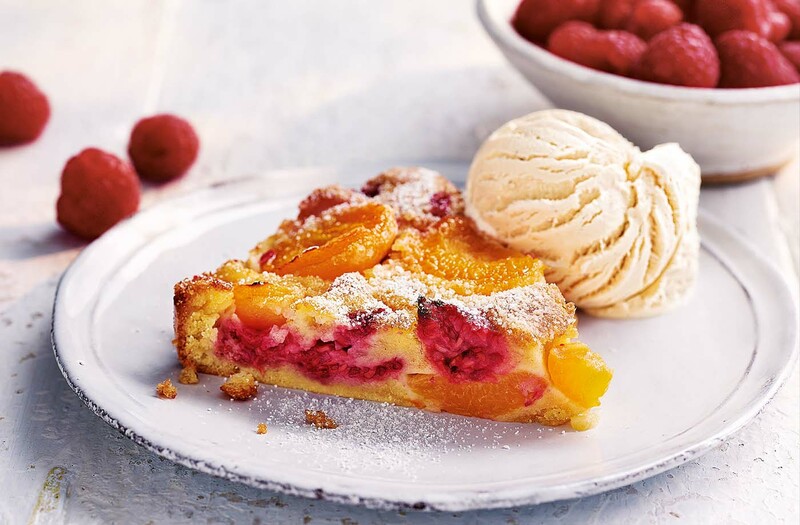 The fruit is cooked in a light batter which becomes puffed and golden in the oven – serve warm with ice cream for a delicious treat. Preheat the oven to gas 6, 200°C, fan 180°C. Grease a 24cm quiche dish (not loose bottomed) or round baking dish. Melt half the butter in a frying pan over a low-medium heat. Add the apricots and sprinkle over 1 tsp caster sugar. Cook for 2-3 mins, stirring occasionally, until softened slightly and beginning to turn golden. Set aside to cool slightly. Melt the remaining butter in a microwave or small saucepan. In a large bowl, whisk the eggs with the 100g caster sugar until light and frothy. Fold in the flour with a metal spoon, then gently stir through the melted butter. Scatter approximately half of the apricots and all of the raspberries over the base of the baking dish. Evenly pour the batter over the fruit, then add the remaining apricots, cut-side up, pressing into the batter at various angles. Bake for 30 mins until golden, set and puffed up. Serve warm with a dusting of icing sugar, if using, and vanilla ice cream or whipped cream,if you like. Chocolate lovers – Replace 25g of the plain flour with 25g cocoa powder and drizzle with melted dark chocolate just before serving. Make it your own – Swap the apricots with any other seasonal stone fruit – try peaches, plums, nectarines, mango or cherries.